The Yellow-collared Macaw is very playful and loves to take showers! Distribution: The yellow-collared macaws' natural habitat runs from the northern and eastern Bolivia , east into Brazil, and south into northern Paraguay and northwestern Argentina. There are isolated populations in central Brazil as well. They inhabit widely varying environments from humid forests, woodlands, and agricultural areas. Yellow-collared macaws adapt well to areas where people live and is considered securely established in the wild where it is frequently seen in large flocks. Size - Weight: Yellow-collared macaws can reach full lengths of 38cm (15 inches). Description: Yellow-collared Macaws are a mini-macaw, like the Hahn's Macaw and Severe macaw, that have predominantly green bodies. The forehead, lower cheeks and crown are brown. The edge of the wings are blue, mainly on the primary feathers. The tail is blue at the tip and becomes reddish brown towards the base. The underside of the tail and the flight feathers is yellow. The bare face is creamy white and the bill is dark gray that turns lighter towards the tip. The legs are pink and the eyes are orange. See About Macaws: Social Behaviors for information on developing a well rounded friendly macaw. (Also information on handling and activities). Breeding/Reproduction: The usual clutch consists of three or four eggs laid two or three days apart. The eggs incubate for about 25 days. The babies will fledge after about 10 weeks in the nest. Feed the parents plenty of greenstuffs, corn-on-the-cob, carrots, and fruit laced with food supplement while they are rearing the youngsters. See About Macaws: Breeding/Reproduction for information on breeding. Availability: The Yellowed-collared Macaw is a common mini macaw. It should be easy to find these macaws for sale. I am Called Mr Terry Bong and I have 9 macaw parrots and 4 African Grey parrots for adoption. I need only pet caring homes to give them out to. I am soon starting up a new Job and must give them out. I give out each with a cage. My email address is terrybong2010@yahoo.com for any one interested. Hello - have these all gone? We are a pet loving family and have been thinking of adding a miniature macaw to our menagerie ......... please let me know if still available. Thank you. Would also be interested to know where you are geographically. So does this mean you have any macaw or African Greys available 12/11/10? I would be very interested in adopting a young Grey or yellow collar. I have owned both and used to breed. 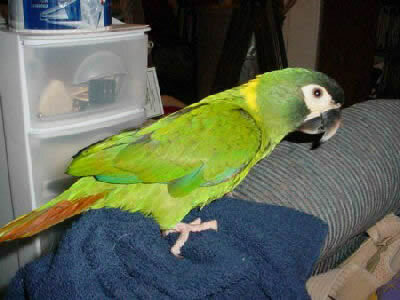 I only have 1 38 yr old white eyed conure presently and have been wanting another bird. I live in MN and if you are serious please get back to me. Hi my name is Darci I am 28 single and my baby Mango just passed away. She was my everything . I know she can never be replaced. But I am looking for a new pet bird to share my life with .. Please contact me if you have any left that you are trying to get a new loving home for ..
Just checking to see where you are located and if you have any of your parrots left. Hello Mr. Terry Bong; my name is Gilbert Rodriguez & I recently lost my Charlie a Yellow Collared Macaw which which I had since he was 1yr old in 2003 needles to say I'm looking to replace him so please let me know if you can help, Thanks!!! Where do you live at I live in newaygo michigan if you live out of state I'll pay half the plane ticket and they flown to sparta michigan phone number 231-652-1874. I really love my bird and she needs a friend, I really enjoy all day long with her and will love to have a few more, she is a military macaw and had a yellow collard mini macaw. Really love my babies. Looking for a yellow collard i live in lake elsinore socal. Retired @49 due to work injury will be with the yellow full time. I am unmarried and am looking for a long term pet. ISO Yellow-collar Macaws - young, bonded pair for breeding. North FL area. Prefer to pick-up, not ship. Oh these little fellers are just the greatest! My male yellow-naped, "Frankie", is the house comedian. They love to play and they love to be with you and on you all the time. He's my morning coffee drinking buddy sitting on my shoulder. And at night he snuggles up under my chin and preens my hair so gently it almost puts you to sleep. Laughs like a human. Loves to be handled. Flips over in your hand to be petted. Gives kises and lord does he love a shower! I gave up on the suction cup perch in the shower. Frankie loves to be on your shoulder and shouts, "WOOOOO!" and laughs when you go under the water. Of course he's all grown up now. He calls himself "Frank" now. Great pets! They can be nippy at times and Frankie always says, "OWW!" when he bites so he knows what he's doing. They can get very territorial with only one person and then bite YOU when others are around. They need to be socialized with many people. They are very intelligent and pretty easy maintenance. Great animated birds but they are VERY LOUD. If you are looking for a quiet bird, the yellow-naped is not for you. They do vocalize. And if not clipped, they will hunt you down in the house. LOL! Frankie lands on your shoulder and says, "Peek-a-boo!" Be very careful with birds if you have ceiling fans. Keep those little wings clipped to protect them. I've had my yellow napped macaw (named Charlie) for almost 2 yrs now. Charlie is a female & she's bonded with me. She's 15 yrs old and is housebroken - she won't poop until she's back in her cage no matter how long she's out of it. Due to a damaged wing she can't fly but can glide down to the floor. She's not crazy about taking a bath. I have to take her to my shower & set her on the little chair I have there before I turn on the water. Then she just sits there with her head held back the entire time the water is flowing. She's learned how to imitate my laugh and can speak a few works. She doesn't like fresh fruit or veggies but is crazy about sunflower seeks and those little white hard seeds. Unfortunately she's got the Macaw's wasting disease. As best as I can I try to get her to gain weight but she still very thin. She loves to sleep with me and is learning that cuddling is fun. YES! she can bite a lot and make deep wounds on me but she's learned she get in trouble when she does this. The one thing I'm finding out about this breed of bird is apparently not to many people have them as I can't find anyone who has one. I've got a lot of questions if I ever do find someone who has them. If you do own one let me know. I'm also looking for more pictures of the yellow napped macaw. I've found a lot of yellow napped Amazon macaws but not to many of the yellow napped macaw. Sorry, misspelled. Our FB group is called "Yellow Collared Macaws"
Hi, I have a sweet little YCM who is now 17 years old. I thought she was a 'he' (per pet store) until 4 years ago when "Homer" laid her first egg! She is a 'one person' bird, prefers me.But some people are able to socialize their Yellow Collars so they accept others. She's very playful and aware. They used to be more plentiful but in past few years are harder to find in North America. Note- I saw a post few years ago re someone having birds for sale.More than before, be very careful who you deal with online.Scams are everywhere these days.You need to check out the references and business before you buy! For those who'd enjoy a group that features these adorable mini macaws please ck out a FB group "Yellow Colored Macaws" for pics and thoughts about them.And what it's like sharing your home with one. Looking for a baby Yellow Collared Macaw preferably a male but would consider a female.